With the cold winter months ahead, I decided I better come up with a few things to entertain the kiddo indoors. 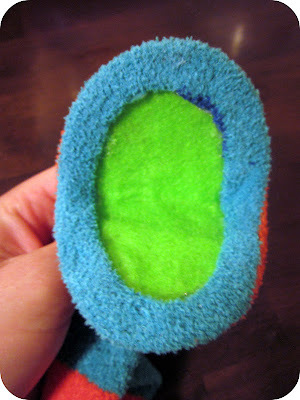 I found an easy tutorial from One of a Kind Gift Ideas for a darling monster sock puppet and went to work! 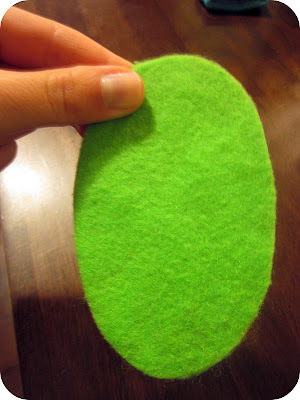 Step 1: Cut out a cardboard oval. Mine was about 4 inches long. Step 2: Trace your cardboard oval twice onto your piece of felt. 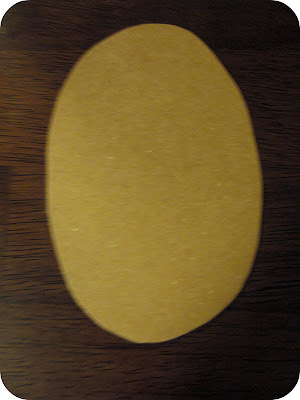 Hot glue a piece of felt to each side of the cardboard. 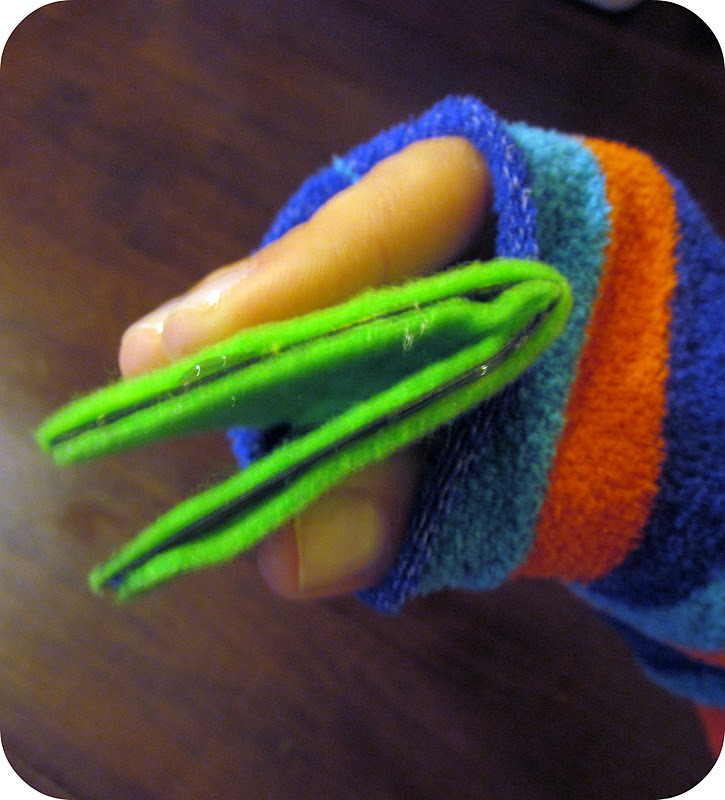 Step 3: Cut the toe off the end of your sock, slide your arm through and adjust the cardboard to work as a mouth (fold in half). Step 4: Roll the ends of the sock under and hot glue them to the felt covered cardboard to create the mouth. Step 5: Decorate! I used pom poms for the eyes, felt for the razor back and hot glued on random pom poms all over the body. Just be creative! Love it! How easy and fun is that, thank you for sharing!! I love how easy this is to make! I bet it'd be a hit with my kids! Thanks for the tutorial! Thank you SO much for sharing this super-adorable idea! My three year-old is so excited to give gifts to her friends for Christmas and I've been searching for fun, inexpensive gift ideas that her and I can make together. I am fairly (EXTREMELY!) 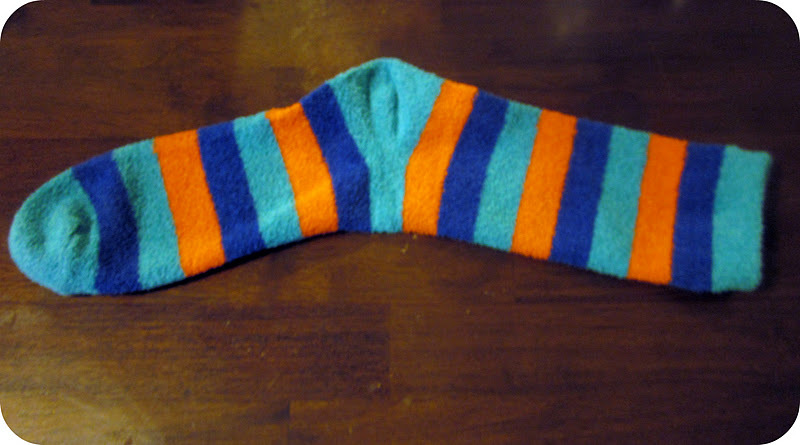 craft-challenged, so this sock monster is PERFECT! Thank you! What a cute little craft. We would love for you to link this up to our linky party going on right now. So cute! What a fabulous idea;) Thanks for sharing! So fun, colorful and cheery! Would you please share these with my readers for Fun Stuff Fridays? Found your puppet from TT&J. 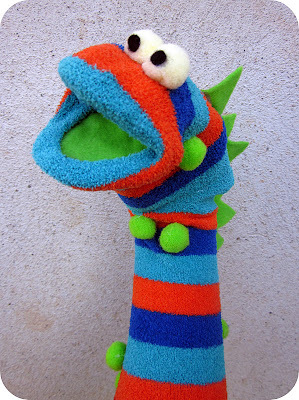 This puppet is so cute, I love that it doesnt involve sewing! So neat! Love love it. I have got to make one for maddux he would love it. Thank you so much for linking up to last weeks show and share. Make sure to come back and link up this week with your latest project. Love this little guy! I may have to put some of these on my to-do list! I found this on Pinterest and made one for my little guy today! It looks awesome! Thanks for the fun and great idea! I love this project! I'd love it if you'd join me on my T.G.I.F. Linky Party that I host every Thursday evening - Sunday. I love this!! I am featuring this on my blog later today when I highlight sewing and craft projects for kids. how do you do the spikes? We just cut triangles out of felt and glued them on with hot glue. Love this tutorial!! Thank you so much; I now have a lovely sock monster for my friend and her 1 year old :D Great tutorial and such a cute puppet!! Thank you for sharing this lovely puppet.